We are committed towards bringing your business all the tools and features needed to excel in your various forms of operation. These brief highlights serve to outline our main top solutions and features available to your company. If you have any additional questions on our plans and pricing, feel free to contact our team on 1-800-886-5369. 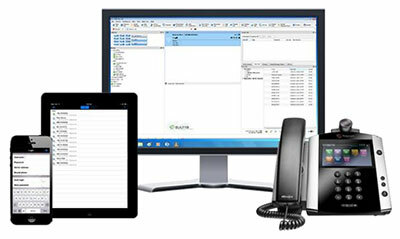 YipTel delivers a suite of Mobile solutions that allow you to connect to the corporate phone system from virtually any device, anywhere. Applications are available for your iPhone, iPad, Blackberry, Droid, Tablets and Laptops that deliver the power of YipTel to you no matter where you may be. This dramatically improves internal/external communications and productivity by allowing you to communicating efficiently with voice calls, video calls, Instant messaging, and visual presence of your entire organization. YipTel mobility solutions deliver productivity. YipTel delivers unprecedented Video calling from your Desktop, Laptop, or Mobile Device to deliver the highest level of visual communication and collaboration. In addition to One-To-One video calling, YipTel enables Video Conferencing services so that you can collaborate as teams, departments, or entire organizations on multi-party video calls. YipTel unleashes with the power of Video Conferencing and content sharing in a cost effective video service provider solution. YipTel Unified Messaging provides: Text To speech Transcriptions of Voice Mail, Voice Mail to Email, Visual Voice Mail, Electronic Fax, and Internal Chat. The YipTel Desktop Client delivers Presence, Instant Messaging, Video Calling, Video Voicemail, Find Me Follow Me, Simultaneous Ring, and much more. This client application combined with the mobility applications will likely save you 10-15 minutes per day, per employee in improved productivity. When you need to make sure you message was received and understood then there is no better way to assure communication than video messaging. YipTel delivers clear video Voice Mail messages. Whether you need a simple operator group or the most advanced Multi-Media and Blended call center queues, YipTel has the right Call Center solution for your organization. Our simple to use web administration portal will provide you with easy access to make changes and modifications to users and call flows from anywhere. Since YipTel delivers our applications from the Cloud, we can connect your multi-site organizations or remote workers over dedicated or open internet connections. YipTel delivers powerful audio conferencing solutions with conference control from the Web and Mobile Devices for the ultimate experience in power and control.